William Molloy at International Yacht Register tells me he's hosting an Open Day on the 36.5m motor yacht Secret Love in Monaco on May 17th from 1:30pm to 6:30pm. Built by Amels in 1990, superyacht Secret Love had a major refit in 2005/2006. MCA compliant, her classic maple wood interior was designed by Struik & Hamerslag accommodating eight guests in four staterooms. Twin 680hp Caterpillar engines deliver a cruising range of 4,000 nautical miles. 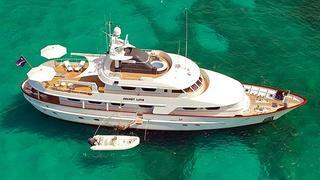 Secret Love is asking €6 million but her owner is keen to hear reasonable offers.